Take a Virtual Tour of the MCH Navigator: View an archived webinar conducted by AMCHP and MCH Navigator staff that walks users through how to use the new website, information about the self-assessment tool, and how to access learning opportunities. Introducing the MCH Navigator: Presentation to the National Improvement Partnership Network, September 2013. MCH Navigator - Relaunch: Presentation to the MCH Schools of Public Health, January 2014. Building MCH Workforce Capacity: Early Adopters and Creative Ways to Use the MCH Navigator: Presentation at AMCHP Annual Conference, January 2014. The MCH Navigator: A Tool for the States: Presentation at AMCHP Lunch and Learn Session, Feburary 2014. Developing Tools to Address Training Needs of the MCH Workforce in Communities at the Local Level: Presentation at CityMatCH Annual Conference, September 2015. The MCH Navigator has been featured in a number of recent articles. 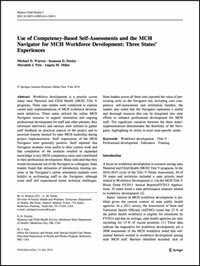 Use of Competency-Based Self-Assessments and the MCH Navigator for MCH Workforce Development: Three States’ Experiences. Maternal and Child Health Journal. Michael D. Warren, Suzanna D. Dooley, Meredith J. Pyle, Angela M. Miller. Published online July 11, 2014. The MCH Navigator: Tools for MCH Workforce Development and Lifelong Learning. Maternal and Child Health Journal. Holly Grason, Colleen Huebner, Alyssa Kim Crawford, Marjory Ruderman, Cathy R. Taylor, Laura Kavanagh, Anita Farel, Joan Wightkin, Deneen Long-White, Shokufeh M. Ramirez, Julie Preskitt, Meredith Morrissette, Arden Handler. Published online August 1, 2014. The Evolving Role of Leadership and Change in Maternal and Child Health Epidemiology. Maternal and Child Health Journal. Michael D. Kogan, Wanda Barfield, Charlan Kroelinger. Published online July 31, 2014. 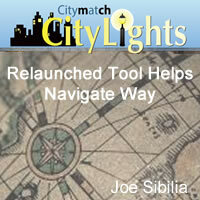 Relaunched Tool Helps Navigate Way. CityLights 21(3). Joe Sibilia. July 2014.